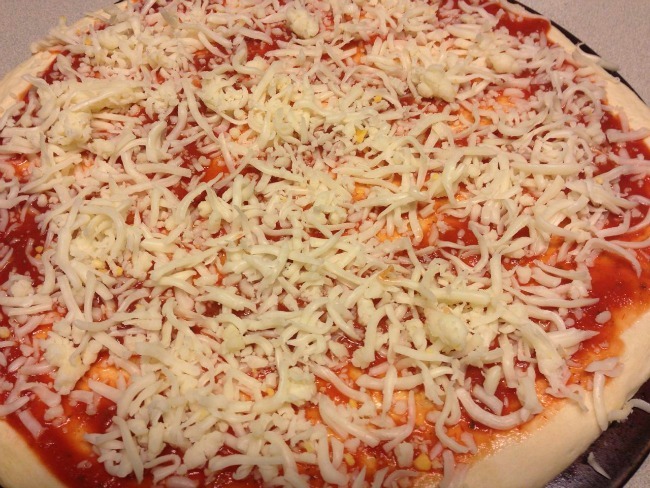 I’ve been anxious to share my pizza recipe with you. It’s special to me because, well, there’s the obvious part about it being the best homemade pizza on the planet, and more importantly (is there something more important than awesome pizza that only costs a few bucks?) it’s a fond reminder of my childhood. Yep. I’ve been eating this pizza since I can remember. My Aunt Helen taught me how to make it when I was young. I got to spend a little bit of time with her during out latest trip to Maine to visit family. She had baked some rolls and made a bunch of pizza earlier that day and just brought them to us out of the blue. When I went to visit her at her home later that day, she wanted to be sure that I had “Gram’s” roll recipe. I do have it, but we ended up digging into her recipe book anyway. It’s a little book with all of her favorite recipes– hand written, in pencil, with the name of the person who introduced her to each recipe. It stirred a long conversation about recipes and lots of stories of the people who made them special. And that’s when I first heard the story of where this recipe came from. We went on to talk about that pizza she always made, how she taught her son to make it and he made it for his college buddies all those years later and still makes it for his family today. We talked about how she always got the spices just right, just a little “kick”, and how my family doesn’t make any other pizza. It was nice to visit with her and to copy down some of the recipes I remember making, (Like this one for Peanut Butter Bars) and some I haven’t tried yet. And now I’m ready to share it with you! Then come on back here when you’re ready to make some awesome pizza. Spray a large bowl with spray oil, or swirl olive oil into the bowl. 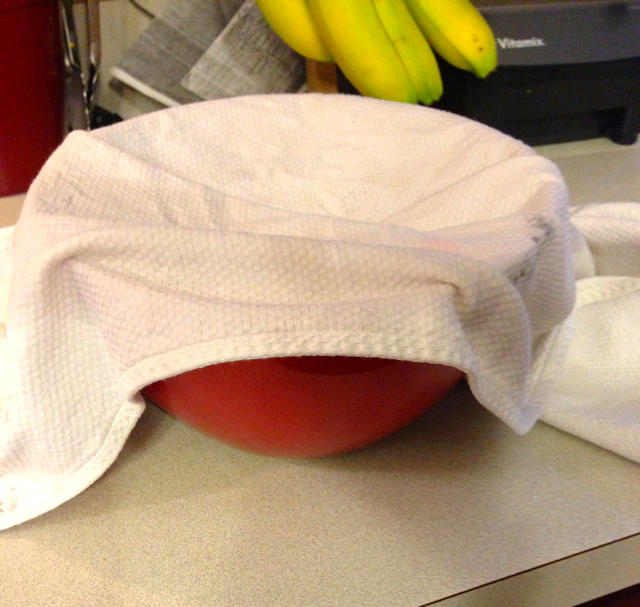 Cover your bowl with a damp towel. Set it in a warm place to rise. It should take about 30-45 minutes depending on the temperature. When you see that it has doubled in size, you’re ready to make your pizza. This dough will rise more in the oven, so be sure to spread it out pretty thin unless you specifically want deep dish pizza (which I can’t understand at all but we all have our preferences.) The dough in the pizza in these pics was spread so thin, you could almost see through it in places, and look how thick it is in the oven. It’s not deep dish by any stretch but gives a nice crust. With one batch of dough I always make on pizza on a Pampered Chef rectangle stone and a small round stone. Just to give you an idea of how much it will make. Spread the sauce evenly, leaving a little edge for the crust. Don’t go crazy with the sauce or cheese. You have to be brave here and actually use less than you think you need. Or else you’ll end up with someone else’s pizza recipe that might as well be called something else entirely. Then your toppings of choice–customized for each person, of course! 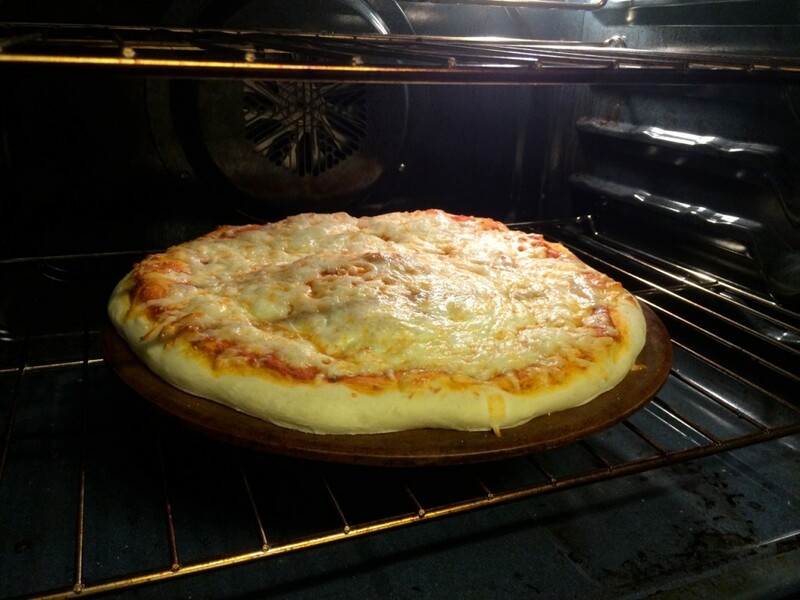 You’ll cook your pizza for about 15 minutes on 425° (preheated!). I use the bottom rack so it gets nice and crispy. If you cook it on a stone it will get a little bit crispier if you let it sit for about 5 minutes before cutting it. Oh I’m so glad it’s Friday! 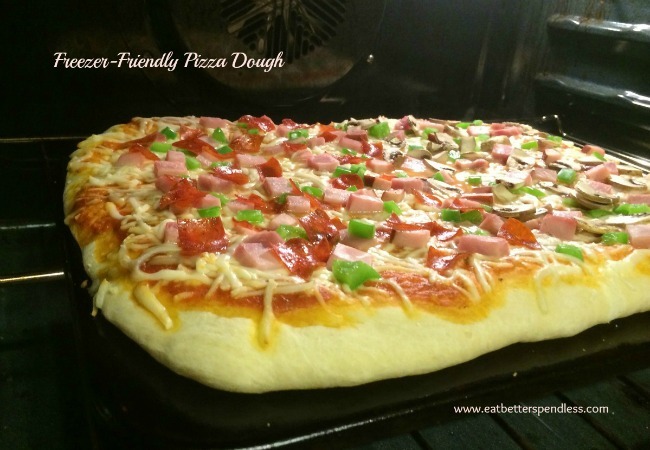 Freezer Friendly Pizza Dough recipe. I don’t think there is much better than homemade pizza. I love making my own. I know exactly what I getting! No fillers, chemicals or artificial anything. Thanks for sharing at Foodie Fridays. So glad you came by and said hello. Connected with you on FB and Twitter too. Have a wonderful Labor Day weekend. We live in the country, so no delivery for us. Will try you freezer dough. Faye, count it as a blessing! Every time we order pizza out we regret it! I hope you like the dough. Yum! Homemade pizza is the best. I never make my own dough though. After reading this, I am thinking I should give it a try! Thanks for sharing it with us at Foodie Fridays! You should try it. I made it look harder than it really is with all the pictures and explanations! It’s worth it. The dough does look good. I use the “Artisan Bread in 5 Minutes a Day” to keep pizza dough on hand in my fridge, but being able to freeze the dough is a definite bonus. Alice, I thought about getting that book, but I think it will be dangerous for me. I love bread (especially homemade) and probably don’t need an excuse to have lots of it readily available! I’ll probably drop my defenses one of these days and get it. Yum!! 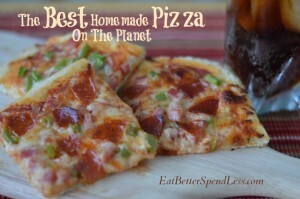 THIS I will definitely try out on our family pizza night! 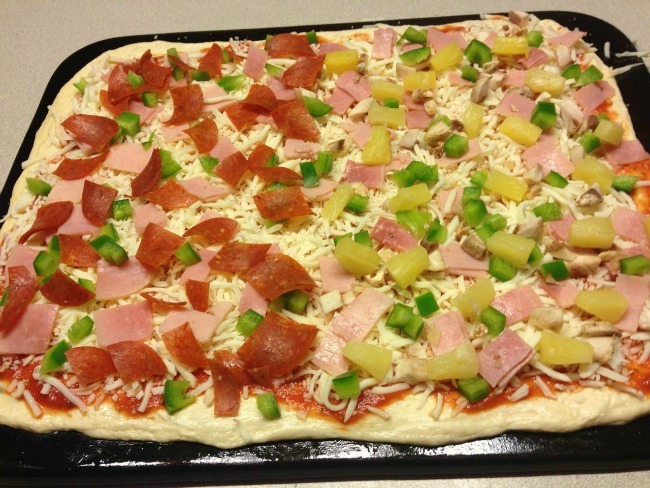 Thanks for sharing your recipe…I’ve been looking for a good one for pizza. That does it! I’m making pizza next week. This looks AHmazing!! Thanks for linking up with #FoodieFridays! Make sure to stop by this Thursday night 9ET to see if you are featured! Oh wow Christie, I’m just now noticing your comment. So sorry! Did you ever make the pizza? I’ve had an unplanned blogging break (starting the day after you commented so that explains how I missed it) so I haven’t been doing any link-ups but I hope to be back next week!